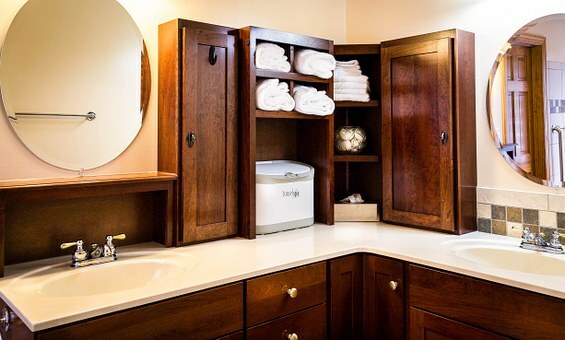 Cabinets are an essential part of any bathroom. After all, where else are you going to store your razors, hair products, face towels, tweezers, skin products and more? If you are looking to buy bathroom cabinets then you will be faced with a whole host of different choices in stores and off of the internet. There are several pointers that you must consider in order to ensure that you narrow down your search effectively and find the best cabinets for your home. First and foremost, you need to contemplate the style of the cabinets. There are lots of different options out there and so you are bound to find something which suits your taste as well as the style of the bathroom. Most people tend to go for either white cabinets or wooden cabinets. Rustic bathroom vanities are particularly popular. A wood finish is a good choice because it has a lot of character and style to it. Its rustic and authentic image and the warmth it has is something you will fail to find in anything else. White is also a popular choice because it is versatile and will go with anything you have in the bathroom. Moreover, the freshness and cleanliness appearance it has is well suited to a bathroom. In addition to style, you also need to consider the size of the bathroom cabinets. First and foremost you need to determine what you are going to be storing inside the cabinets and thus you need to look for a product which will accommodate all of this. Furthermore, you need to decide on whereabouts in the bathroom you are going to place the cabinet. You should then measure this area before you begin to buy because you need to make sure that it will fit into the space properly. In addition to this, you should also consider the price of the cabinets. After all, because there are so many different choices available this means that there are lots of different priced cabinets. Therefore you are bound to find something which fits into your budget. Nevertheless, going for the cheapest option is not always recommended because it is unlikely that your cabinets will last as long as others on the market. The final thing that you need to consider is the features that the cabinet boasts – this point compromises lots of different things. One of the aspects you need to contemplate is how many compartments or shelves the cabinet has inside. This determines how much can be stored and what can be stored, most people tend to prefer bathroom cabinets with several different compartments so that they can separate their products effectively. Furthermore, you should contemplate other features, such as whether the cabinet boasts a mirror or not. A lot of cabinets come complete with a mirror on the front or inside the door. This depends on taste and whether you have a mirror in your bathroom already or not. All in all, if you consider the points mentioned in this article then you should be able to find the best bathroom cabinet for your home.